Let me preface this post by saying good on Telus for challenging the police for attempting to use a general warrant to get text messages instead of a wiretap order in the R v Telus case released by the Supreme Court of Canada (and summarized in Canadian Privacy Law Blog: Supreme Court of Canada says that wiretap order is required to obtain text messages). It obviously isn't material to the Court's decision, but I wonder why. Actors in the private sector, such as internet service providers, often collect and retain information that may be useful for law enforcement or as part of private litigation. You may recall from the Privacy Commissioner's investigation of Nexopia that the kid-focused social networking site retained information indefinitely, at least in part, in case the police asked for it. In my view, that's not ok. It's not a service provider's job to police its customers, nor is it its job to deputize themselves as agents of the state. Don't collect personal information that you don't need just because it could be useful, particularly if it could be useful to law enforcement or to private litigants. Even if you think you may be required to collect it later, that's no justification to collect it now. Don't keep personal information around any longer than you actually need it. If you are asked for personal information by law enforcement or private litigants, it is much easier to say you don't have it than to go to court to resist providing it (see below). Don't offer law enforcement unsolicited access to personal information just because you see something suspicious. Unless you come across evidence of fraud against your organization or compelling evidence of a serious crime, it is not your job to hand over reams of information to law enforcement. It must be noted that these provisions are permissive, meaning that they allow you to disclose the information in these circumstances without offending PIPEDA. Nothing in the above require you to disclose the information. Any compulsion has to come from another statute or rule of law. 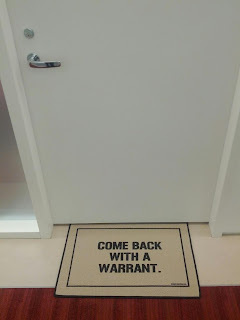 So, if asked, preserve the information and ask that they return with a warrant. If they have probable cause and a reasonable basis to compel the information, they'll be back. If you are served with a subpoena for personal information about a customer, you should immediately notify the customer. If you aren't able to, you should resist the disclosure. A subpoena is not a search warrant. In most jurisdictions, any lawyer representing any litigant can print out a subpoena and go to the court to get a fancy looking stamp on it. All a subpoena means is that you are required to attend at court with the information to have a judge make the final call. There may be no basis for the demand for information and your organization should avoid any situation where it has provided personal information that it was not legally required to hand over. When the internet service providers in the recent file sharing case resisted disclosure and took the matter to court, they emerged as staunch defenders of their users' privacy. That's certainly better than the alternatives. I couldn't agree more with this post, a company's obligation is to its customers not law enforcement. Don't get me wrong, there is nothing wrong with helping law enforcement or collecting personal information. Take Google for example, I happily hand over all personal information they ask for because I like that I get personalized search results and ads. That's right, I like the ads too, if I'm going to see them anyways they might as well be useful to me. I realize that not everyone agrees with my view and that is their prerogative, Google offers opt-out of these things and they are relatively up-front about it. The problem with Telus that you write about and I agree with is that they are collecting information on their subscribers (without telling them, at least google offers an opt-out) with no intent on using it to benefit the user. In fact, from what I can see they are using it to harm the user. More and more companies seem to be forgetting how they actually make money: people paying for their service. Unfortunately, too few people know about things like this but that is why it's important to get the message out and I thank you for doing so.